Sintiklia, e marie, Oppa + More! Don’t forget to pre order your December Powder Pack! 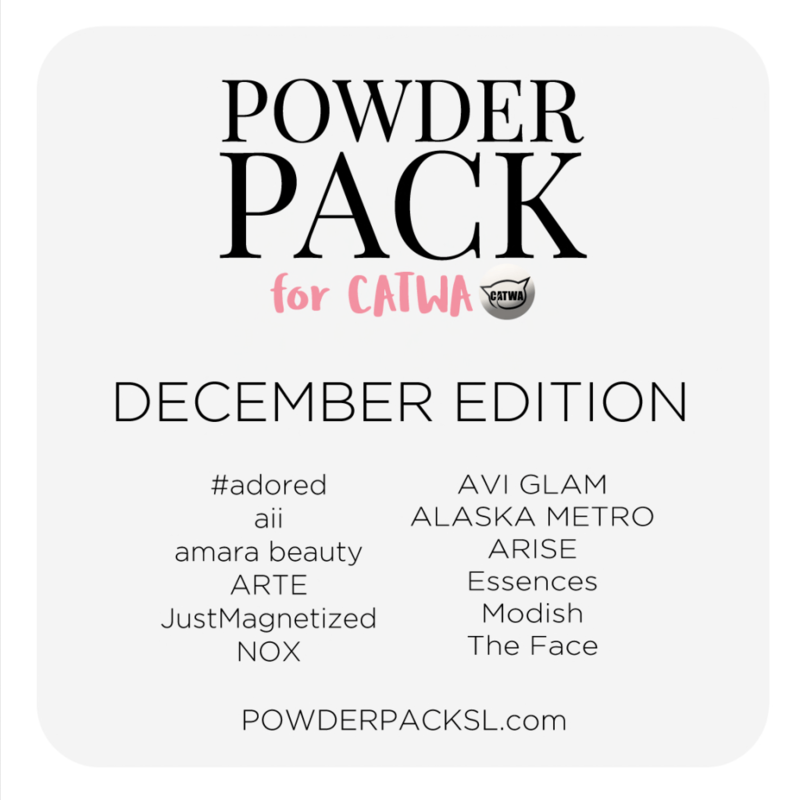 Powder Pack for Catwa DECEMBER Edition reservations are NOW OPEN! You can reserve in-world or on the marketplace between the 1st and the 16th midnight SLT. Your Pack will automatically be delivered to you immediately on DECEMBER 17TH early SLT time. Powder Pack, Limit8, Kustom9 + More! It’s a birthday round at Kustom9 which means DISCOUNTED ITEMS! Lots of designers have cute things out for only $9L! Limit8 will open on the 18th. Don’t forget to get your October Powder Pack!! Oneword in Second Life – Wonderland Round & More! Oh hi! I took a bit of a break from blogging at the end of June because I (drunkenly) decided to start DJing weekly again! It’s fun, though, I’m not complaining! It’s just taken me a little be longer to find the time management sweet spot. This post features some items from the July round of Oneword. Oneword is an event that focuses around a new word for each round. This time the word is “Wonderland” so if you are a Alice in Wonderland fan you won’t want to miss it. The event starts today, July 1st and runs until the end of the month. I’ve managed to make time to make another post! How? I can’t sleep… there is a dripping noise in my apartment and it is driving me totally bonkers. It’s not like I need sleep anyway, right? In this post I am wearing a gorgeous wintery skin that Modish has recently released (also in non-wintery tones) at FROST. The more-revealing-than-I-am-used-to camisole and undies are from Lacuna Inc and can be found at the Seraphim Social! The hair bow is by, Mag♥B, a super kawaii designer that somehow found me. (yay!) The wintery nails are from Elephante Poses. By the way, if you aren’t in the Elephante Poses VIP group you are missing out on some amazing exclusive group gifts this holiday season.. so be sure and join before they are all gone!! This is getting long-winded so check the details for the rest! Sheesh. This is a lovely new skin from Modish, her name is Gala and you can find her at Winter Trend SL! Modish is offering this lovely skin, RoxyMoon, for just $200L at The Rack! The jacket/dress combo is a group gift from Coco and the shoes are a group gift from Bens Beauty! Bargainnnnnnnnnns! The adorable suitcase prop from Infiniti comes with 20 poses and would be great to showcase your shoetopia purchases (if you have had the luxury of getting in yet!). poses and props by infiniti *new*. Crap, I haven’t changed my socks since the last post. If I had a mom in SL she would be so dissapointed! Modish has released two gorrrrrrrrrrgeous new skins! One for the Rockabilly Fair and one for the November round of She & Him. Each skin comes in a few different makeups. Check them out below! skin: modish *new* at the rockabilly fair! skin: modish *new* at she & him!